The Turkish national team at Euro 2008 - rising up from the moment when everyone thinks they are defeated. (Photo courtesy of Futkolik). Turkey turned 94 over the weekend, with Turkish Republic Day marking the proclamation of the modern state on 29 October, 1923. The story of modern Turkey is of a nation rising out of the ashes of the Ottoman Empire's defeat, when the republic's founder and first president Mustafa Kemal (who later took the surname Ataturk) led the Turkish War of Independence. Turkey’s foundational myths often find their way into football. Turkey was twice beaten 8-0 by England in the 1980’s. "They were national humiliations and they’re sort of seen as a repeat of the defeat of the Ottomans by the British Empire in World War One," says the anthropologist Can Evren. "It’s all about this idea of Turks being this group of people that never give up," says Evren. In Euro 2008 the Turkish national team looked like it was heading for a first-round exit. They had lost their first match 2-0 to Portugal. But in both their next two group matches they came from behind to win, and Turkey qualified for the knockout stages. They faced Croatia in the quarter final. It was a tense match in which Croatia missed an array of chances. It remained goalless, until the last minute of extra time when Ivan Klasnic scored with a header for Croatia. They thought it was all over. But 60 seconds later Turkey’s goalkeeper launched a long, desperate ball into the box, it bobbled around and then fell perfectly for Semih Senturk who smashed a left-footed drive into the top corner to equalise. Buoyant Turkey beat Croatia 3-1 on penalties. Germany only narrowly knocked out Turkey 3-2 in the semi-final. "If you look at the Euro 2008 Turkish national team, it's the team that rises up from the moment everybody thinks they are defeated," says Evren. "This is the foundational myth of Turkish nationalist history." Faith Terim, the coach in 2008 and over several other periods, somewhat embodies this scrappy spirit and has orchestrated many of these comebacks. In that perennial dichotomy between tactical sophistication and ‘man management’, Terim comes down firmly in favour of the bollockings and provocations of the latter. As part of a notorious motivational pep talk, he once allegedly said something along the lines of: "That goal is your mother's [c-word]! Don't let anything go in." This approach evidently has its merits. Terim won the league six times and the UEFA Cup over several stints as the coach of Galatasaray. Terim was Turkey’s coach during the Euro 2016 qualifying campaign. After three games they were joint bottom of their qualifying group alongside Kazakhstan. But Turkey went on a remarkable winning spree and qualified as the best third-placed side. Turkey’s slogan for 2016 tapped into the spirit of 2008: "Bitti demeden bitmez" ("It’s not over until we say it’s over"). Turkey suffered insipid losses to Croatia and Spain in their first two matches. It seemed like Turkey was saying it was pretty much over. But after defeating the Czech Republic 2–0 in their final group match, Turkey were set to squeak through to the knockout round, taking the very last spot among the best third-placed teams. But they were ultimately denied another great feat of escapology when Ireland gained an unlikely win against Italy, putting the Irish through and sending Turkey home. Both Terim and the players were lambasted in the media. The midfielder Ozan Tufan had already been blasted for readjusting his magnificent hair while failing to stop Croatia scoring in the first game. Terim criticised the attitudes of his own players for not struggling or sacrificing enough. They had failed to live up to Turkey's foundational myth. Despite the disappointment of France 2016, Terim remained coach for the 2018 Russia World Cup qualifying campaign. They got off to the usual lacklustre start, failing to win their first three games, but eventually they got going and won a few games to put themselves in with a chance. Over the summer, Terim had driven 200 miles to settle some beef, so to speak, by having a brawl at a kebab restaurant owned by a Turkish Football Federation official. Terim parted ways with the national team shortly afterwards "by mutual consent". Terim’s replacement, the Romanian Mircea Lucescu, has a great record as a player and coach – including in Turkish club football. As a more refined and cerebral figure than Terim, he is perhaps less able to draw on the red-meat motivation deemed necessary by some to win Turkey decisive football matches. Turkey's penultimate qualifier in October was a must-win home match against Iceland. Victory would have meant leapfrogging their opponents into qualification contention. But Turkey lost 3-0 and squandered any chance of qualification. If the sour image from Euro 2016 was Ozan Tufan's hair-smoothing, this year's equivalent was Arda Turan laughing after he had been substituted while Turkey were trailing by three goals. With its young, football-crazed population of nearly 80 million, and sixth largest revenues in European football (debts notwithstanding! ), Turkey should be one of Europe’s strongest footballing nations. In the soul-searching that followed the loss to Iceland, some made tactical critiques of incoherent game plans and baffling selections, or more structural analyses that lamented the lack of focus on youth development in favour of short-termism. But ringing out most clearly was the sense that the overpaid players don’t care enough. Their attitudes were compared most unfavourably to those of Turkey's national amputee football team, who gained adulation for defeating England to win the amputee football European Championship a few days after the Iceland debacle. "Military service is not the only way to serve the nation. You can also serve your country by playing football. Play for the national amputee team." 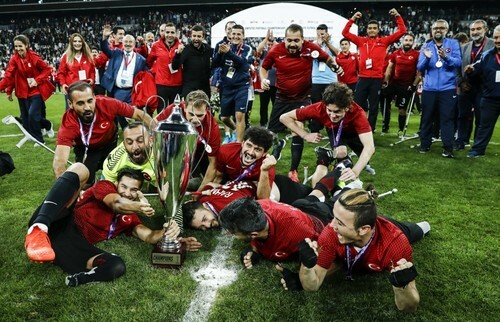 The rapturous response to their victory extolled the amputee team for displaying what the regular national team were accused of lacking: a quintessentially Turkish spirit of resistance, of never giving up, of victory against the odds.